Michael Markham’s grandpa was a chef and ex-Marine who ate pork every day, so Michael’s love for pork and cooking must be genetic. He remembers cooking scrambled eggs at age eight and preparing homemade pastas for his North Carolina State University college roommates while they watched The Sopranos. Michael soon found himself skipping class to watch Alton Brown’s Good Eats on the Food Network and learning everything he could about food. He worked in the financial planning business for seven years but pork kept calling his name. Michael was smoking pork out of a terracotta flower pot for fundraisers and realized that people were actually paying for his barbecue. It wasn’t until an interview for a new job with a food distribution company that Michael was motivated to start a food truck, Big Mikes BBQ. Although the job recruiter would have loved to hire Michael, he encouraged Michael to follow his dream of serving his community with delicious barbecue. 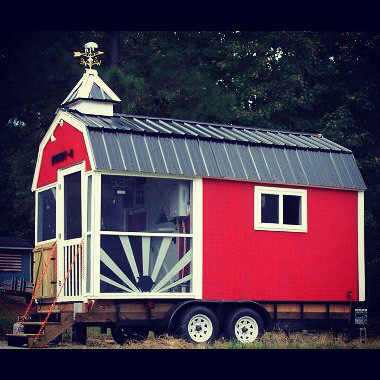 The recruiter happened to know a man in Johnston County with a food truck for sale, a big red barn on wheels. Finally Michael’s dream became a reality; this spring Big Mikes BBQ began dishing up ribs, brisket, pulled pork and other unique Southern fixin’s to the Triangle. 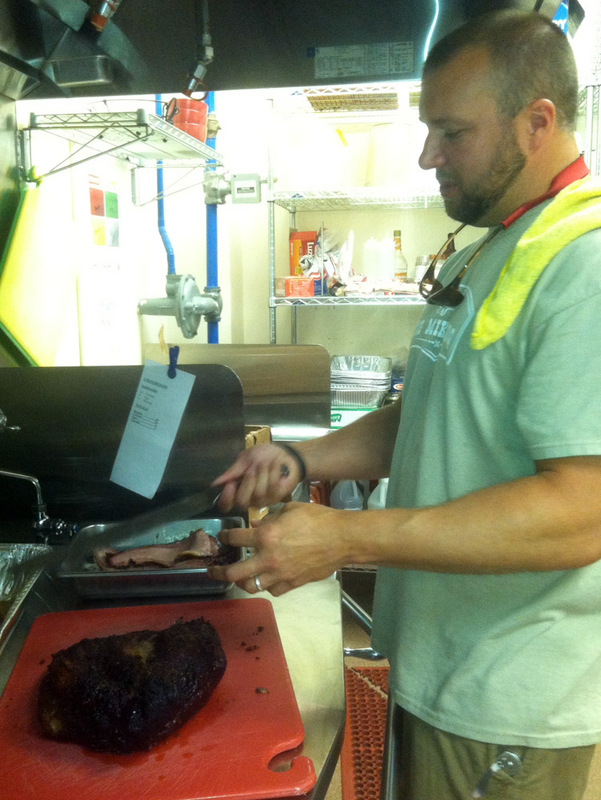 To get the full food truck experience, Michael offered me the opportunity to work on the Big Mikes BBQ food truck. We started at 9:30am on Friday morning at Hope Community Church in Cary. Michael attends church here and they allow him to use the commercial kitchen for food preparation and storage. I was put to work scooping ice and filling the cooler with sodas. 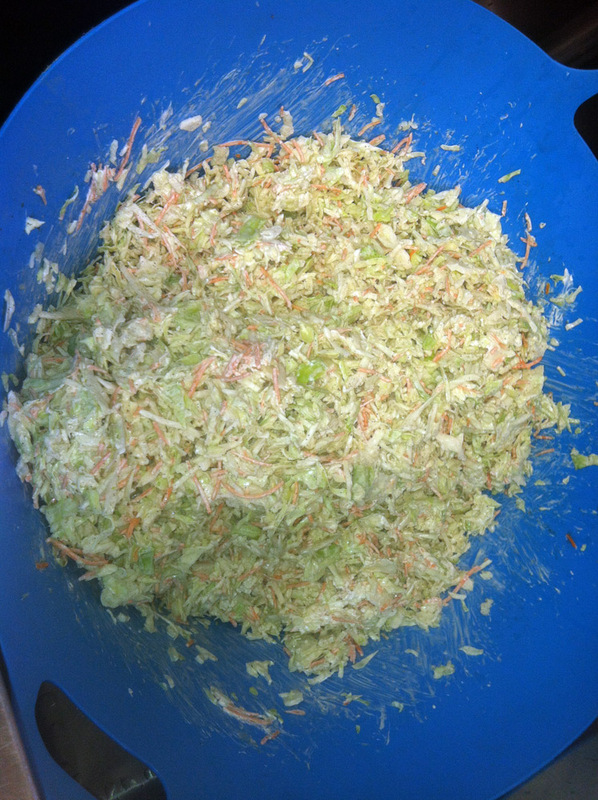 Michael also taught me how to make his famous blue cheese coleslaw. He discovered that adding blue cheese and a good amount of black pepper kicked traditional coleslaw up a notch. One thing that Michael learned from his grandpa was to taste your food as you cook. Before serving anything to his customers, Michael gives each dish his seal of approval. If you’re not a slaw lover I guarantee you will be after tasting Michael’s blue cheese coleslaw, it’s crunchy, creamy and delicious! Before we knew it, 10:45am rolled around. Michael finished slicing the beef brisket while Kimathi made sure everything was secured inside the big red barn. They’ve had a few disasters on the food truck, like a cooler of tea spilling out of the barn onto interstate 40! We set up the BBQ barn for lunch around 11:15am. I helped Michael take orders while Kimathi dished out food to the hungry customers. 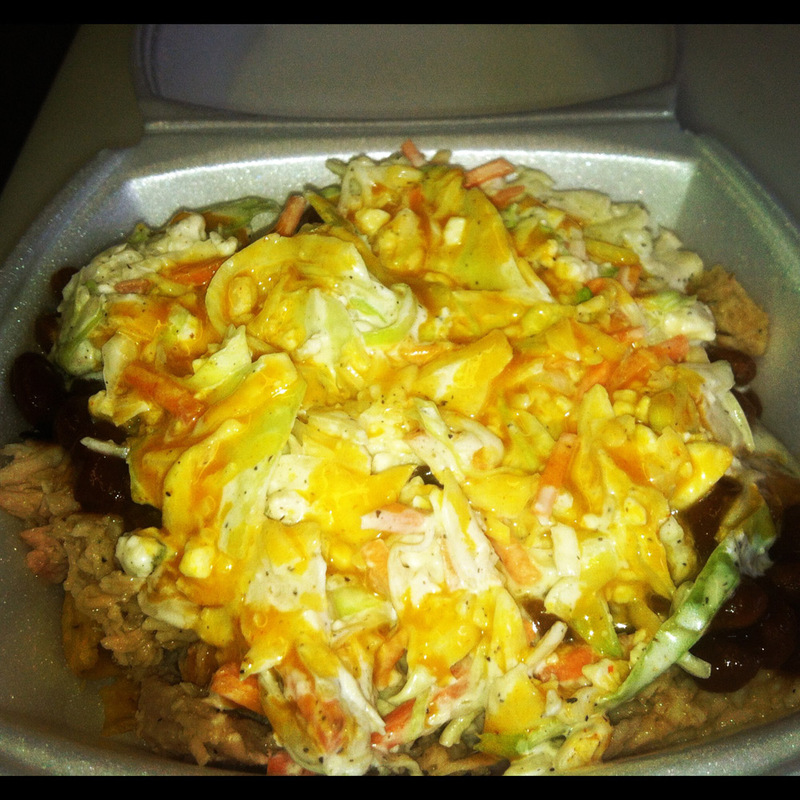 One customer told me she is a huge fan of the redneck nachos, Fritos topped with Eastern North Carolina pulled pork, baked beans, blue cheese coleslaw, and sweet hot mustard. Talk about a flavor explosion. Sweet, savory and spicy all in one dish! The Fritos also add a nice crunch factor. What makes the redneck nachos is definitely the pulled pork. If you’re a barbecue connoisseur please do me a favor and go taste the juicy pulled pork at Big Mikes BBQ. 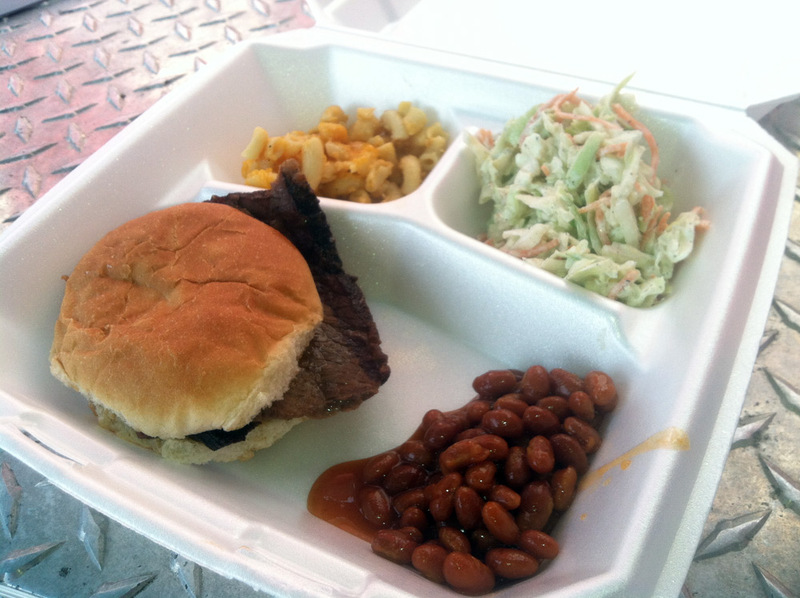 Many of the customers ordered a plate, which includes a meat and two sides. You have the option of ordering pulled pork, honey smoked barbecue turkey or beef brisket. The homemade sides include the blue cheese coleslaw, smoked potato salad, macaroni and cheese, baked beans, and string beans. It’s so hard to decide! For lunch I had a beef brisket sandwich and sampled three sides. The macaroni and cheese was super cheesy and creamy. The baked beans were sweet and tangy and went along nicely with my beef brisket sandwich. The beef brisket was cooked to perfection, tender and juicy with a flavorful rub. I would probably gain a few extra pounds if I worked on Big Mikes BBQ food truck! 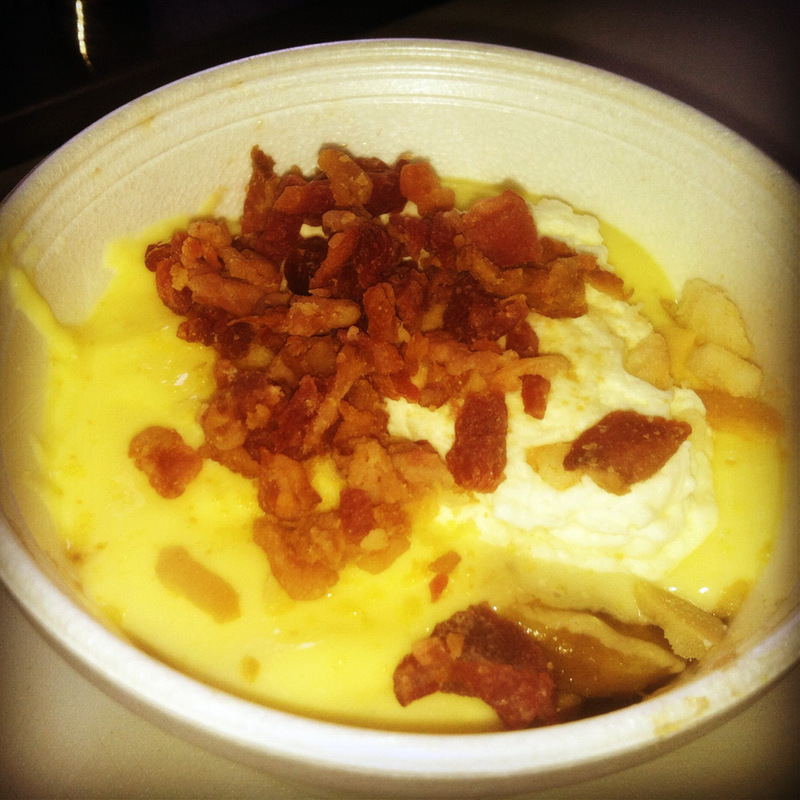 You also have to try Michael’s baconana pudding next time you visit the food truck. Baconana? That’s right. Banana pudding with bacon! Everything is better with bacon. Michael and Kimathi convinced me to work on the food truck for dinner and we finished up around 10pm. I didn’t realize how much preparation goes into a food truck business or how tired I would be after working all day. Thankfully the food truck business is fun and of course, delicious! 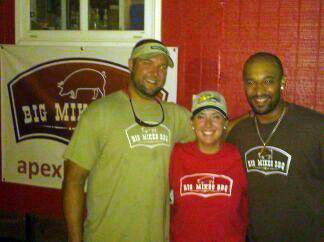 Follow Big Mikes BBQ on Twitter to see where the BBQ barn will be next. 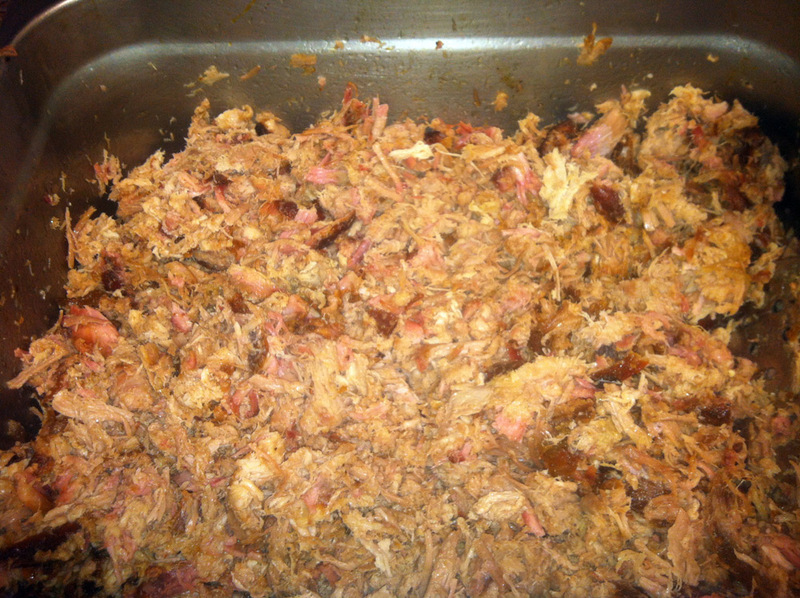 I know you need to satisfy your pulled pork craving by now!